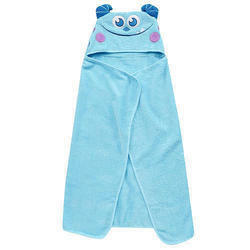 We are one of the leading manufacturer and supplier of kids hooded towels, We are supplier wide range of quality products with efficient pricing. Vogue Sourcing is Manufacturer, Supplier, Exporter of Hooded Towels. Our Garment factory make Hooded Towels in various designs, colours and sizes. Hooded Towels is made as per customer's custom style and design. Our offered Hooded Towels is made in high quality international standard. Best Hooded Towels Manufacturers in India. Set of 3 sheets shades: 3 size : 20/30"